With the limited time that we're in Europe and all of the places that we have yet to see, why would we visit Ireland for a third time in two years? The answer, quite simply, is that we hadn't seen the best part yet. 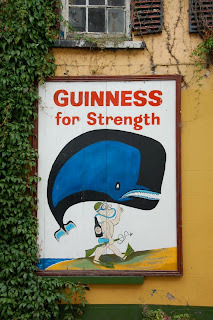 This series of blog posts fill feature our week-long excursion to the Southwest and West regions of Ireland covering four Counties that I will dub the "All-County" Team: County Kilkenny, County Cork, County Kerry, and County Clare. We began this adventure when we flew into Dublin from Edinburgh and met up with Marisa's mom, Susan. We had four days with the three of us before we would be meeting up with Susan's husband, Terry, and there was much to see before then. Pictures are below, but we basically drove down to the Rock of Cashel, then over to Kinsale for a few days with side-trips to Cobh, Midleton, and Cork. Rock of Cashel, County Kilkenny - en route to Kinsale; unfortunately we didn't get any full shots of the former castle and church since there were so much scaffolding in place. Rock of Cashel, County Kilkenny. 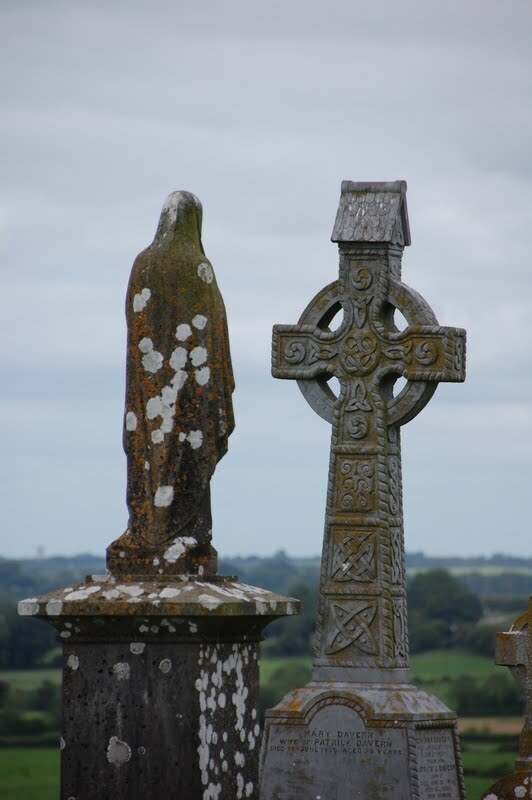 There's no shortage of moss-covered celtic crosses and really cool-looking cemeteries. 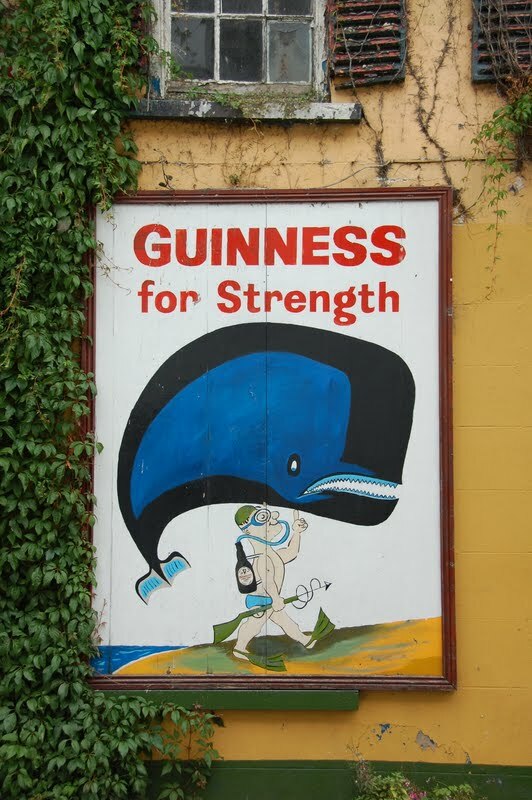 Kinsale, County Cork - I love these cartoony ads for Guinness all over the country. Kinsale, County Cork - We were blessed with arriving into town when the annual Kinsale Regatta was getting kicked off with live music each night. As a bonus we got this blonde haired kid doing some riverdance stuff. Kinsale, County Cork. It's a great alternative to saying in Cork city. Kinsale, County Cork - Mother/Daughter shot. Bulman Pub - Kinsale, County Cork. We spied a couple taking wedding photos here earlier, then we dove in to take a break and a sample of the Irish trifecta: Guiness, Bulmers cider, and Jameson whisky. Cobh, County Cork - pronounced "Cove", it was a huge leaving point for many of the immigrants to the U.S. and Australia. There was a well-done exhibit here dedicated to the immigration and shipping industry of Cobh. We especially liked learning about the brief period in time where people traveled by large ocean liners for vacation - not like Carnival cruise line, more like the Titanic which also had its last port of call here before setting out for its ill-fated maiden voyage. The Irish always claim that "it was fine when it left here." Cobh, County Cork - posing in front of Annie Moore, the first Irish immigrant to be processed at Ellis Island, along with her two younger brothers. It was crazy to think that many of these immigrants left family with the expectation that they may not ever seem them again, but that it was a better option than staying during certain periods of time. 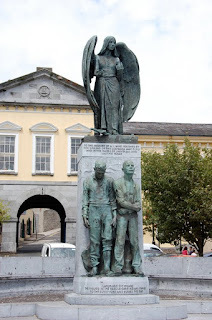 Lusitania Memorial - Cobh, County Cork - The Lusitania was a passenger ship that was sunk by a German submarine just off the coast of Ireland near Cobh during the First World War. Many of the survivors were cared for in hotels in Cobh. Old Midleton Distillery - Midleton, County Cork. John Jameson came here from Scotland, of all places, and used existing distilleries to make his trademarked brand using his own special methods and turned out to be fairly successful. Although we're not huge whisky people, we did the Jameson tour at the Old Midleton Distillery and learned plenty about whisky making. The Irish triple-distill their whisky and it is clear when it is first barreled (as shown on the left). After three years the whisky is not yet matured, but has a yellowish color (2nd barrel). After five years the whisky is ready to be sold as a normal bottle of Jameson (3rd barrel). After 7-8 years it looks like the 4th barrel as it has taken the darker color from the barrel. I think the last barrel was a 12 year whisky. Also notice how evaporation and absorption affects the barrels over time - the Irish and Scottish both call this the "Angel's Share". I was driving, but Susan and Marisa were up for the whisky taste-test, pitting three whiskies against each other: Jack Daniels, Johnny Walker (Scotland), and Jameson. Both agreed that Jameson was actually smoother, Jack Daniels is sweeter, and Johnny Walker is smokier. Outside our B&B in Kinsale. Both B's were on point! We loved the proprietor here, Jimmy, and his Irish hospitality. The only hang-up was on our last night where we forgot to lock our door and a man in the room next to us stumbled out in the hallway and mistook our room for a bathroom!! No, he didn't actually relieve himself in our room, but it was a tense moment until he realized his mistake. So, we had all of this fun before we met up with Terry in our next stop..........Kenmare, County Kerry. We also spent the better half of a day in the city of Cork, but the weather wasn't great and we didn't come away with any great pictures.